One of the easiest ways to launch your own home-based business is to join a direct sales opportunity. Also known as multi-level marketing (MLM), network marketing, and home party plan businesses, direct sales is the business of selling products or services face-to-face away from a brick and mortar location. Companies offer starter kits that give you everything you need to launch your own home-based business. Most starter kits include catalogs, order forms, sample products, business cards, training materials and your very own website. Your first prospects and buyers will be friends, family, and acquaintances; you will then build your customer base by getting referrals. As a direct sales consultant, you will be paid a commission for each product that you sell. Most direct sales companies will also pay you a small bonus commission from consultants who you referred into the program. With thousands of home party plans to choose from, there is something for everyone. No matter which home party plan you decide to join, you need to have a passion and enthusiasm for the products that you’re selling. To cultivate this passion, you’ll need to make sure that you chose a niche that excites you, and products that knock your socks off. The best way to find out what the best products are is to purchase a few products from the company and test them out for yourself. Once you find high-quality products that you LOVE using, you can move on to the next step in your home party plan search. Commission rates vary significantly in the direct sales arena; I’ve seen everything from 15% – 60% commission on sales. But along with this number, you’ll want to explore the other earning opportunities that each company offers. Some companies will pay you an additional commission for each consultant that you sign up underneath you. Other companies will have a tiered format where they pay you a higher percentage for meeting individual sales goals. And some companies offer cars, trips, and other incentives for reaching and exceeding predetermined amounts. Another factor you'll want to consider is how much each product costs. For instance, if you’re going to be selling jewelry and the average price per piece is $25, and your commission is 25%, you’ll need to sell $500 or 20 items to make $125 per party. Many direct sales companies include what the average sales per consultant are on their website – so make sure to look at all of the numbers before making your decision. 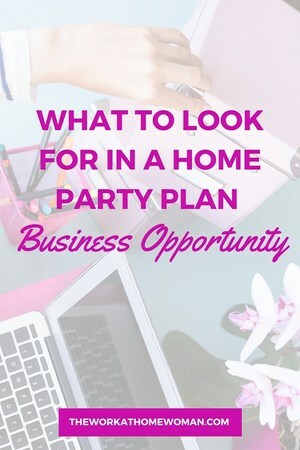 When choosing a home party business opportunity, you’ll want to make sure that you’re doing business with a reputable company. Look for companies that have an affiliation with the Direct Selling Association (DSA) which promotes ethical business practices in the direct sales market. Check out the Better Business Bureau (BBB) website, make sure that they have an excellent rating and all customer grievances have been resolved. Also, look around on Google and see if there are any negative reviews or complaints. One of the best ways to learn about a company is to talk to current and past consultants. Find out what they like and don’t like about the company. See if you can find out what the retention rate is, and if consultants are paid on time. By putting in some additional effort on the front end, you can potentially divert an unpleasant experience on the backend. 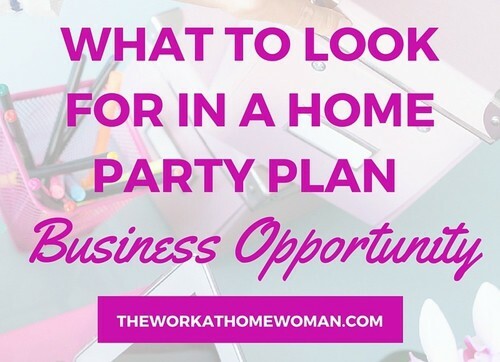 If I were going to get involved with a home party plan business, I’d want to be able to market my direct sales business through social media, blogging, and email marketing. But did you know that some direct sales companies don’t allow their consultants to do this? Find out how you will be able to market and promote your business. If you’re restricted in how you can market and advertise your business, you may want to look for a different company. Another area to consider is how you're allowed to sell products and services. Some companies will allow to sell online via your website, social media channels, and email marketing. Other companies allow catalog sales and other companies only allow in-home shopping parties. Look for companies that offer diversified selling options so you can maximize your earnings. A large part of your success will rely on how good your training materials are and what type of support you’re given. Find out how consultants are trained. Are you paired up with a mentor? Are there live events to help motivate you? Again, talking to other consultants can be a great way to see what type of support you get. Lastly, make sure you read all of the fine print. Many companies have monthly recurring fees for websites and marketing materials, as well as sales quotas to remain active as a consultant. Talking to someone live can help clarify any unclear policies or procedures. Not sure what questions to ask? The FTC has a great list of questions to ask potential direct sales companies, so you don't fall victim to a lousy opportunity or scam. By carefully researching these seven distinct direct sales factors you can help to cultivate your success within the home party business arena. I like inexpensively decorating my house with inexpensive pretty things and helping others do the same that are on budgets. I also like jewelry and clothes on a budget. Have you looked at The Smart Living Company, Linen World, Martha and Mary, or Signature Designs? They all sell home decor items. You may also want to check these posts that cover jewelry and clothing opportunities. I’m looking for a direct sales opportunity that doesn’t cost a lot of money. As I’m a pensioner, and can’t afford a lot. I don’t want Avon, and Regal has gone out of business. What else can I do?